This article addresses the necessity of the existence of the Representative of Allah on the earth at any time. The opponents of Shi’a protest that although Shi’a consider the Imam necessary in order to expound the injunctions and verities of religion and to guide the people, the occultation of the Imam is the negation of this very purpose, for an Imam in occultation who cannot be reached by mankind cannot be in any way beneficial or effective. The opponents argue that if God wills to bring forth an Imam to reform mankind, He is able to create him at the necessary moment and does not need to create him thousands of years earlier. In answer to this, it must be said that such people have not really understood the meaning of the Imam, for the duty of the Imam is not only the explanation of the religious sciences and external guidance of the people. In the same way that he has the duty of guiding men outwardly, the Imam also bears the function of “Walayah”and the internal guidance of human. The divinely appointed Imam directs human’s spiritual life and orients the inner aspect of human action toward God. Clearly, his physical presence or absence has no effect in this matter. Imam is the representative of Allah (Khalifatullah) on the earth, and is His vice-regent. He is the connection between the heavens and the earth, and is appointed by Allah as the intermediate for the rest of the creatures. His existence is always necessary, even if the time has not as yet arrived for his outward appearance and the universal reconstruction that he is to bring about. Let me provide an example to clarify this delicate issue. Any human needs blood to continue his life, and the existence of blood is necessary in every single moment of life. This need is not, in anyway, independent of God. He is God who has created this need for human, and He is the one who has fulfilled it. Similarly the function of Imam over the rest of creatures is not independent of God. He was Allah who created this need for the universe and He was Allah who has fulfilled it. Allah (SWT) wished the inhabitants of the earth not to be able to live without the existence of His representative on the earth, the same way that Allah wished our body not to be able to survive without blood. Notice that in the above examples, both Imam and blood are no more than the creation of Allah. A divinely appointed Imam is a human, but being human does not mean that he could not have any authority over other human by the permission of Allah. The closer the human is to Allah, the more authority he will have. Closeness to Allah is obtained through obedience and piety. When one reaches that level of perfection, he does not desire anything except Allah’s orders. Imam is not divine, but he is fully supported by divine power. He has been given authority as the Qur’anic verses below testifies. This authority has come from Allah and is also controlled by Allah. Another example would be to consider a company with a president and some managers and employees. The one who is closer to the president (in his position or any other aspects) has more authority than the others. This authority is given and is controlled by the president at any time. This authority is not in parallel with the authority of president, and remains as long as the president wishes to. The authorized person does not feel independence and cannot do anything against the order of the president, otherwise the position will be taken away from him. The president has appointed that person to carry out a task. ??????????????? ????????? ????????? ??????????? ????????????? ?????????? ?????? ???????????? ??????????? ???????? ????????? ????????? ??????????? ?????? ???????? ????????? ??????????? ?????????? Moreover, on the commentary of Qur’anic verse: “And lo! verily I am Forgiving toward him who repents and believes and does good deeds, and afterward he accept guidance (20:82)”, Ibn Hajar mentioned that it is narrated from Imam Muhammad al-Baqir (as) as well as Thabit al-Lubnani that, the end of verse means “he is guided to the Wilayah of the Ahlul-Bayt.”(al-Sawa’iq al-Muhriqah, by Ibn Hajar al-Haythami, Ch. 11, section 1, p235). Who are those Imams whom Allah gave them authority and are to be obeyed beside the Prophet? The above verses of Qur’an prove beyond doubt that a divinely appointed Imam has authority and he guides. The authority of Imam is not restricted over a group of people but also covers every other creatures (see Qur’an 36:12 which uses the word Imam for keeping the account of everything). Again, this authority is controlled by Allah. “(O’ Muhammad!) You are but a Warner, and for every community there exists a Guide.”(Qur’an 13:7). ???????? ????? ??????? ????????? ?????? ????? • Kunooz al-Haqa’iq, by al-Manawi, p42. ????????? ???????? ?????? ??????? ??? ?????? ???????????? The above verse is another proof for the fact that there exists one individual at each era who is spared by Allah (Baqiyyatullah) on the earth to maintain the cause of faith and he is the Imam of that age, and this position was never vacated so long as the earth carries even one human being. This, in fact, is a doctrine of Shi’a Muslims that a “Proof (Hujjah) of Allah”should always exist on earth for earth to continue its function as a living place for human being. It is NOT that Hujjah is god or life-giver, rather it is because Allah has created the world for the best of His servants. The best of Allah’s creation is the one who is the most obedient to him at each time. Other creatures are considered to be secondary objects in the sight of Allah. Besides, there are traditions stating that if it happens that there exists only one human on the earth, he is the “Proof (Hujjah) of Allah”. This implies that Allah never left the human on the earth without His representative. At the time of the prophets, the Hujjah were the prophets. Now that there will be no prophet after Prophet Muhammad, the Hujjah is his living Ahlul-Bayt at each era till the day of resurrection. The necessity of the existence of a Hujjah on the earth follows that this world will end when the last Imam passes away. • Manaqib Ahmad, and many more such as al-Tabarani, etc. • al-Mustadrak, by al-Hakim, v3, p149, who said this tradition is authentic (Sahih). • Also in al-Manaqib Ahmad, as quoted by Muhibbuddin al-Tabari. To my opinion, it probably refers to the Ahlul-Bayt, since Allah created this world for the sake of the Prophet, and has made its existence conditional to the existence of his Ahlul-Bayt for they have certain virtues in common with the Prophet as Fakhr al-Razi mentioned, and because the Messenger of Allah said on their virtue that: “O Allah! They are from me and I am from them”since they are a part of him as their mother, Fatimah, was a part of him. Thus they (Ahlul-Bayt) are also amnesty for the earth (similar to what the above verse establishes for the Prophet himself). The occultation of the twelfth Imam is divided into two parts: the first, the minor occultation (Ghaybah al-Sughra) which began in 259/873 and ended in 329/939, lasting about seventy year. On that period, people were in contact with him through four special deputies. These four deputies knew the place of Imam and were able to directly contact him. That period served as preparing his followers to the absence of the Imam. The second, the major occultation which commenced in 329/939 and will continue as long as God wills it. There is no special deputy in direct contact with him in this period, and Muslim scholars are his general deputies at this time without having ability to meet him. It might be that the Imam (as) showed himself to someone during the major occultation, but it was never a regular occurrence, and no one can claim to meet him anytime he wishes. Moreover, even if Imam (as) appears to a person and gives him an instruction, it is only personal, and is not meant for all people. The Shi’a doctrine quite clearly states that the Imam (as) would not deputize a person at this time. In fact, any claim of receiving new public orders (which are not found in our traditions narrated from Ahlul-Bayt) during the major occultation is considered itself to be the proof of the falsity of such claim. There is no specific place of residence known for Imam al-Mahdi (as) and no one knows his whereabouts on the earth except Allah, and he has been seen by different people throughout his life in various locations of the world. “Rest assured, no one has a special relationship with Allah. Whoever denies me is not from my (community). The appearance of the Relief (al-Faraj) depends solely upon Allah. Therefore those who propose a certain time for it are liars. ???? ??? ??? ??? ???? ?? ??? ???? ??? ?????? ??? ?????? ???? ???? ???? ???? ????? ???? ??? ???? ?? ??? ? ??? ????????. ???? ??? ???????? ?? ?? ????? ?????????? ?????? ??? ?????? ?? ??????? ??????? ???? ????? ??? ????? ??? ?? ?????? ???? ???? ?????? ??????? ?????? ?????? ????? ??? ??? ????? Guidance can be of different ways. Do we need to see God to guide us? How about the Prophet who has already passed away? 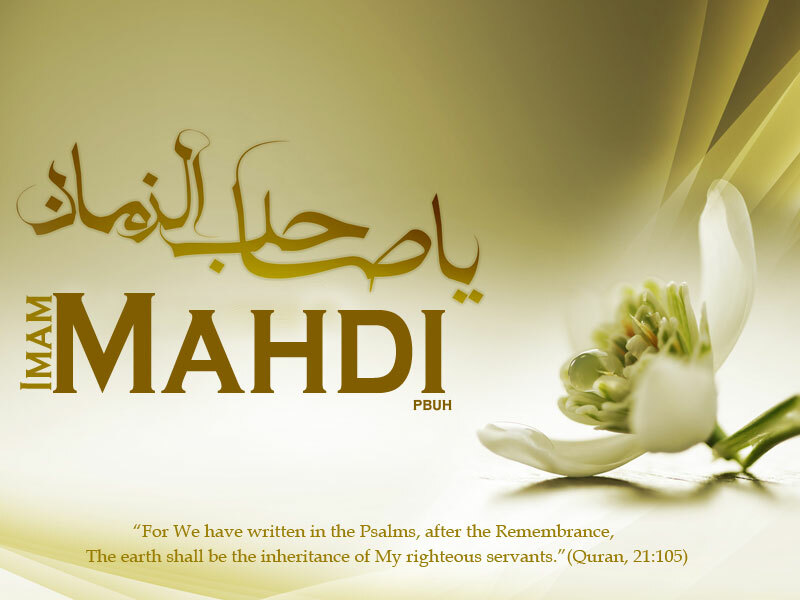 The above tradition of Imam al-Mahdi (as) gives a very interesting analogy, and the same analogy was given by the Prophet (S) on the account of Imam al-Mahdi (please see the article titled: Leadership and Infallibility). If we want to see our way and in order to walk safely, we need light. The Sun provides this light for us even if it is hidden behind the clouds where the eyes do not see it directly. Similarly, we benefit from the guidance of Imam al-Mahdi (as) even though we can not see him during his period of occultation. As I mentioned earlier, Imam al-Mahdi and all other Imams and prophets are not anything but the best creatures of Allah. They were NOT divine in any way. However, I have seen few English translated Shi’i books in which the phrases like “divine Imam”or “divine Prophet”have been used. By looking at those books in the original language, it became evident that by “a divine leader”the translator meant “a divinely appointed leader”, that is, a leader who has been assigned by Allah (and not by people). Such phrases should not any how imply that those leaders are divine themselves. This is the matter of understanding the phrase. Although there are many translated Islamic books which have very poor translation, but fortunately the occurrence of such ambiguous words which are critical to the understanding of the reader, is quite rare. Also Imam al-Mahdi (as) is not a prophet, and as such he will bring neither a new religion nor a new religious law. He does not cancel any regulations set by Prophet Muhammad (S), but he will enforce the true Islamic based on the genuine Sunnah of the Prophet (S). However there are some authentic traditions which state that although Imam al-Mahdi does not bring any new law when he comes, some people say: he is bringing a new religion. Those traditions further explain that it is as a result of many innovations set by pseudo-scholars into to the religion of Islam. Imam al-Mahdi’s mission is to reject all the innovations and to revive the Sunnah of Prophet Muhammad which was polluted by people throughout the history. As a result of ignorance of people to the true Sunnah of Prophet, they think he is bringing a new religion. Some traditions say that Imam al-Mahdi will also provide the unique interpretation (Tafsir book; divine commentary) for the Qur’an.